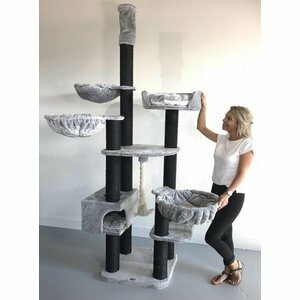 Cat tree for large cats Catdream de Luxe Blackline Light Grey. 54KG. 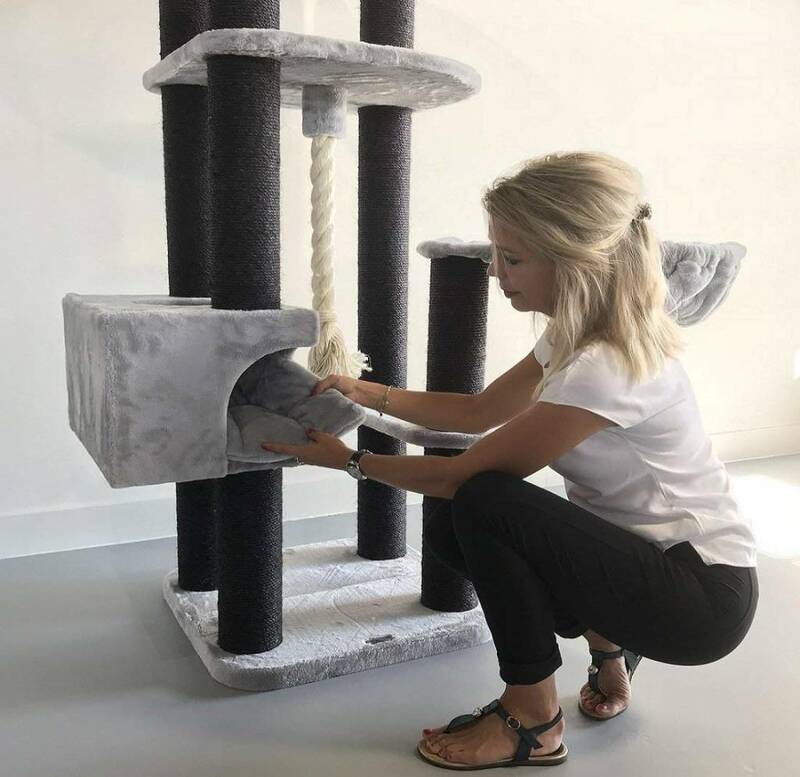 Sisal posts full sisal 12cm Ø. Scratching post activity centre for large cats, floor to ceiling. Quality production from RHRQuality. All poles with full natural sisal Ø12cm. 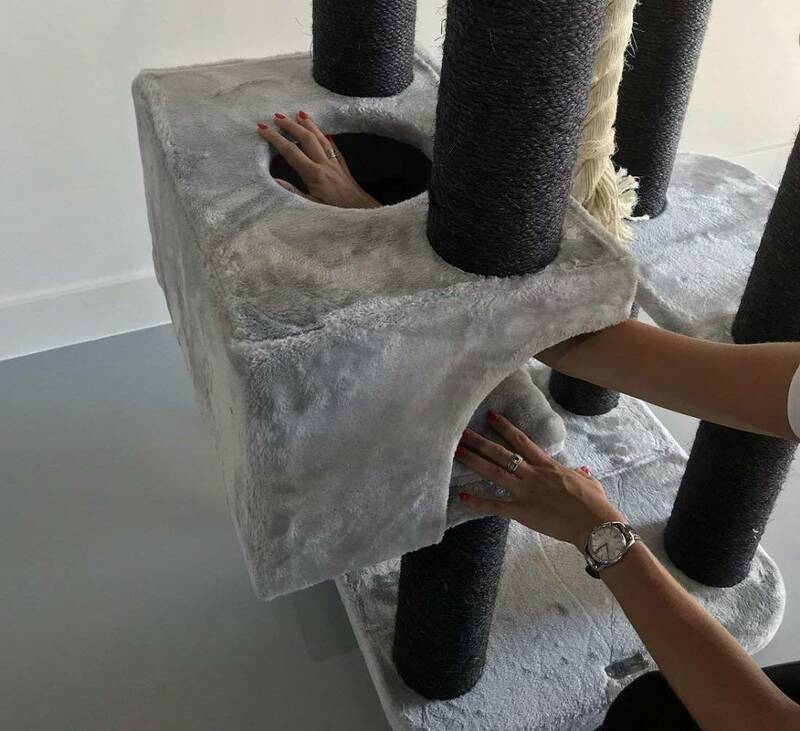 Total 54KG Quality cat tree. Real heavy 600 gr thick Plush which is glued on al plates. Most durable method for long use. 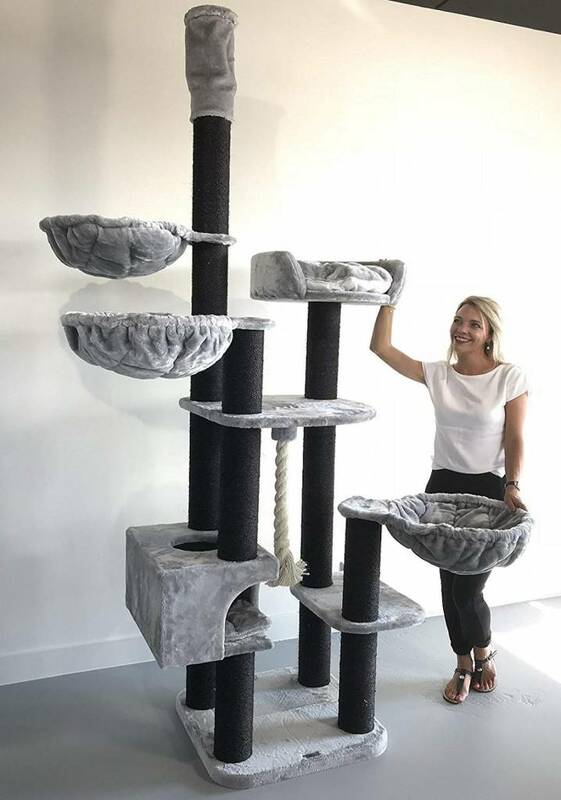 Unique with all Cat trees from RHRQuality is that all parts can be re-ordered! Hammocks 45cmØ de Luxe (With a extra thick metal ring, the strongest in the market. Can carry up to 20kg). Unique is that all hammocks are a combination between a pillow and a hammock so very soft and the dream off any cat. Base plate: 60x60 and 4 cm thick. Made extra heavy for stability. Very large 50cmØ management seat with removable pillow with Velcro. Large playhouse with 2 entrances and very soft removable pillow. Playhouse is made very strong. ( A child could stand on it). Also very thick 5cmØ play rope. 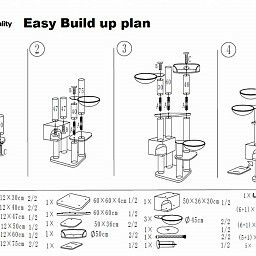 Adjustable ceiling height from 240cm till 265cm (Higher possible on request). Goes pressed against your ceiling and creates pressure from above so it stands like a house. High quality from top brand RHRQuality (Dutch design). 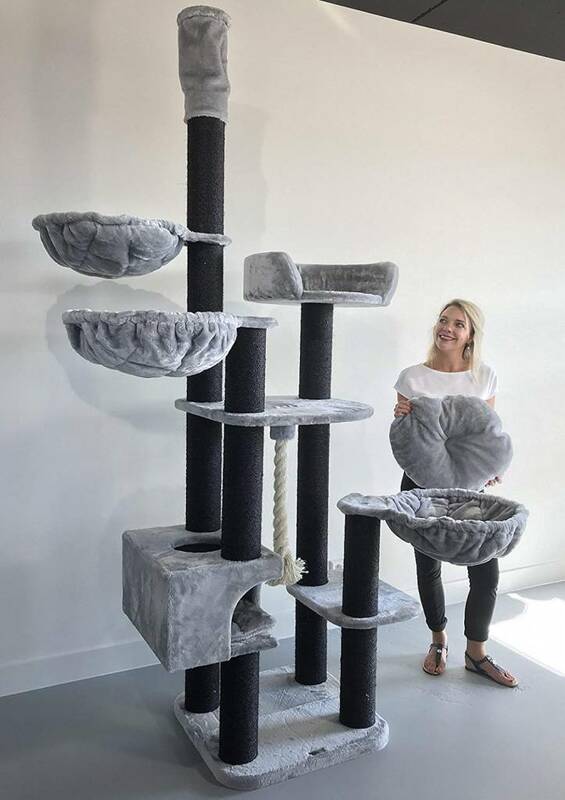 The brands that makes the difference in Large Cat trees. 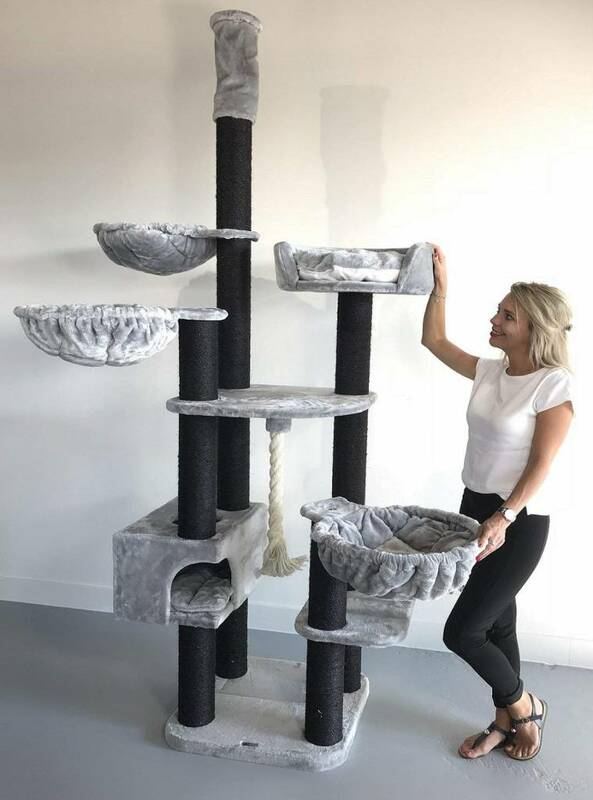 Cat Tree Catdream de Luxe Blackline Light Grey is one of the most steady cat trees in the market. Total 54KG A real RHRQuality Cat Tree. This is the new 2018 model (Currently introduction price) Catdream de Luxe with poles full sisal, hammocks de Luxe 45cmØ. Plush very heavy 600gr which is glued on all plates. Most steady construction with 4 cm thick extra heavy bottom plate and four 12cm thick sisal poles that go up. 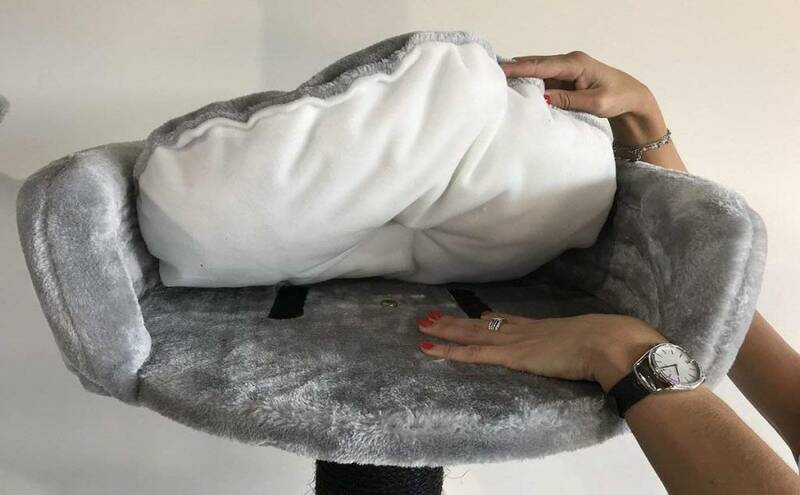 Al parts are connected and the Catdream de Luxe you can attach against your ceiling (Adjustable height). This way it gives pressure from above and will stand as a house.The piece on top which is adjustable is very nice covered with a pluche sock, so when it stands, it looks beautiful. The Hammocks with a lying place of 45cmØ on the Catdream de Luxe can carry easy till 20Kg, so strongest in the market. Unique is that all hammocks are a combination between a pillow and a hammock so very soft and the dream off any cat. 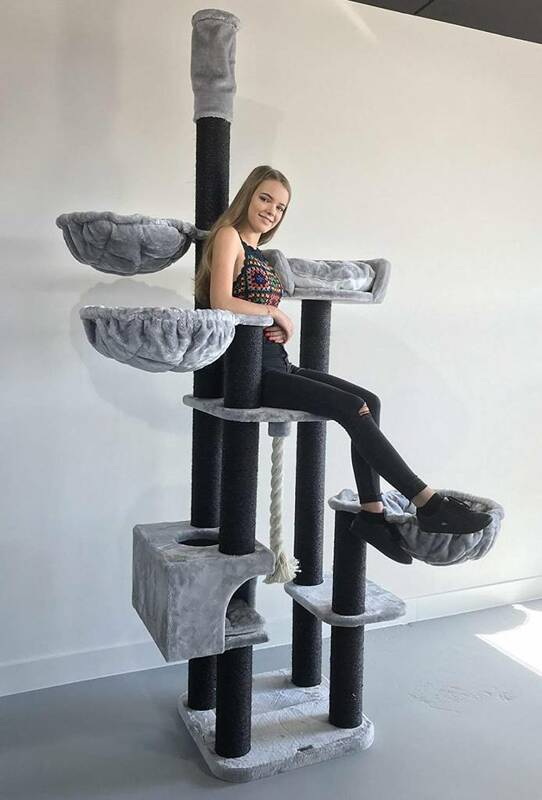 A very nice large playhouse made very strong ( A child can stand on it) to hide makes this cat tree complete. It has 2 entrances (front and top) and a very soft removable pillow. -Very large 50cmØ management seat with removable pillow with Velcro. 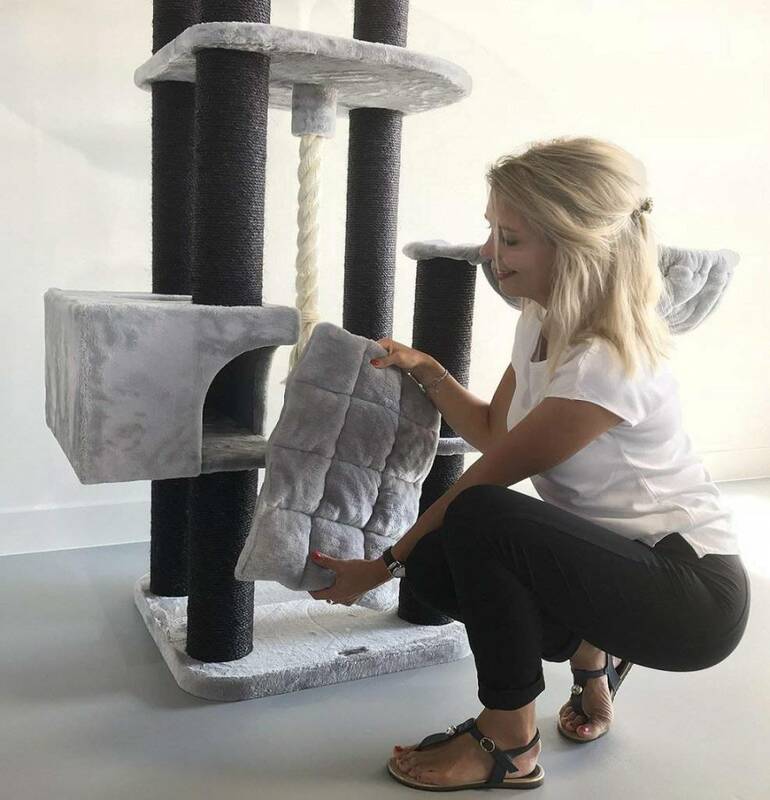 This Cat Tree is designed in Holland. High Quality production from RHRQuality.